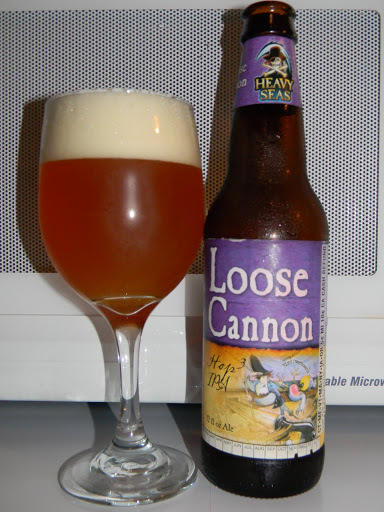 Heavy Seas | Beer Apprentice - Craft Beer News, Reviews, Interviews and Info. Hi guys. For today’s craft beer review I’m going to be trying the Heavy Seas Small Craft Warning Uber Pils produced by the Heavy Seas/Clipper City Brewing Company located in Baltimore, Maryland. I can’t say that I know much about this brew, so let’s get to the website, hsbeer.com, and see what we can find out. Pale in color and rich in malt flavor. With firm structure of noble hops it is both powerful and complex. Pairs well with chicken and fish. Let’s get it into a glass, shall we? This brew comes in a 12 oz. bottle and has an ABV of approximately 7.25%. With the pour the beer appeared an orange to golden color. It was mostly clear with some burnt yellow and orange highlights at the bottom of the glass. The head was off white and of real nice size. It was kind of soapy, soft, rocky and billowy. The retention seemed pretty good and the lacing looked ok too. The aroma of the Uber Pils presented fruity hints of orange and lemon citrus. A decent amount of breadiness and some grainy aspects mixed with some hints of spice. It was nicely balanced, however it was not overly robust, complex or strong. The taste revealed a bit more of the grain and breadiness. A slight hop profile and a decent sting of bitterness was noticed. Some more of the orange and lemon citrus added a bit of brightness as well as some sweetness. Hints of white pepper spice helped create some character and aided in balancing the taste. Not bad. The mouthfeel was medium bodied. The carbonation was good and it had a suitably dry and crisp feel. It was mostly smooth and a very light warmth from the pepper spice and alcohol gave a bit of pleasure. A little bit of flavor was left behind so as to savor a bit of the taste after the sip. This was a decent brew I thought. It wasn’t quite like a typical Pils though. It was a bit more floral and hoppy than a typical Pilsner styled beer might be. It had a more than worthy aroma and flavor and I think it would pair well with the Spring and Summer season, however it wasn’t overly complicated or complex. I think it would be worth your while to give it a try if you see it. It’s a fairly easy drink for 7.25% and it displayed plenty of character to accredit some discussion. All in all, it was just a nice, enjoyable and refreshing drink. So, if you see the Heavy Seas Small Craft Uber Pils, give it a try and let me know your thoughts. Do you think it’s worth a second go-round? Thanks for reading and commenting guys. I appreciate it. For today’s craft beer review I’m going to be trying the Peg Leg Imperial Stout from Clipper City Brewery/Heavy Seas Beers located in Baltimore, Maryland. I have tried several beers from Clipper City/Heavy Seas and have enjoyed each and everyone of them and I’m pretty sure we have a solid beer on our hands with this effort. The description from the website, hsbeer.com, is as follows. Deep mahogany in color with aromas of roasted coffee, molasses and dark chocolate. Subtly hopped, making it astonishingly smooth and easy drinking for such a big beer. Pairs well with blue cheeses, beef and chocolate desserts. This beer has an ABV of 8.0% and comes in a standard 12 oz. bottle. It poured a super dark brown to black color. Only the most minimal ruby highlight was shown at the very bottom of the glass. A well sized, khaki colored head was formed that was very creamy and smooth in texture. The retention time wasn’t bad and the lacing was adequate. The aroma had a nice smokey, roasted and slightly toasted malt fragrance. Hints of coffee grounds, dry cocoa powder and bakers chocolate. No distinguishable dark fruit in the nose, but I did detect the slightest hint of hops. A pretty straight forward, but worthy, bouquet on this beer. The taste seemed to reveal more of the chocolate. Similar to chocolate milk I thought. Rather heavy on the roasted malt and coffee. The smokey aspects were tamed in the flavor, however it did have a slight “chalky” taste on the back end though. I did find a little bit of the dark fruit in the taste, but it was very relaxed and subtle. It had just a smidgen of bitterness from the hops, but it never distracted, instead my attention was focused on the roasted, sweet malts. The mouthfeel was medium, smooth, creamy and soft. Not quite as dry or as chewy as I thought it might be. Oh well. Some warmth was left behind after the swallow, however only an average amount of flavor remained on the palate between sips. This beer isn’t too bad at all really. It has a very nice roasted aroma and flavor, plus plenty of sweetness from the chocolate malt. It was fairly easy to drink considering the 8.0% ABV. I would recommend you give it a try if you favor Stouts. It’s not quite the best Stout on the market, however it’s far from the worst. Just a solid beer. I think this would be a great “introductory” beer for someone wanting to explore the Imperial Stout style. The Heavy Seas Peg Leg Imperial Stout fits right in with the cooler days and nights that lie ahead. Again, thanks for reading and commenting everyone. It’s much appreciated.